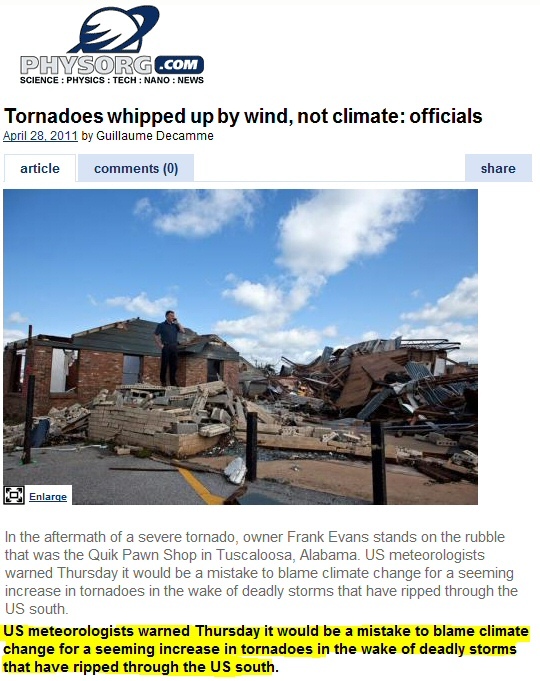 "…it would be a mistake to blame climate change for a seeming increase in tornadoes" | Watts Up With That? "…it would be a mistake to blame climate change for a seeming increase in tornadoes"
“If you look at the past 60 years of data, the number of tornadoes is increasing significantly, but it’s agreed upon by the tornado community that it’s not a real increase,” said Grady Dixon, assistant professor of meteorology and climatology at Mississippi State University. “It’s having to do with better (weather tracking) technology, more population, the fact that the population is better educated and more aware. So we’re seeing them more often,” Dixon said. But he said it would be “a terrible mistake” to relate the up-tick to climate change. Full story here. h/t to Dr. Leif Svalgaard. Hmmm, where have we heard that technology-population-aware argument before? ← Real Climate on Spencer – Bad timing or just bad judgment? The number of “intense” tornadoes has been going down since 1950. REPLY: But the overall number of tornadoes, especially the F1-F2 smaller ones, are on the increase, many of which went unnoticed before. Surely this guy (Dixon) is a f%@#*n climate change denier paid by Big Oil and that’s it. And we all know that climate “scientists” are so diligent with their work that they never make terrible mistakes. Interesting that the previous time this happened was in 1974 – same year we Aussies experienced extensive flooding similar to this year’s floods. Which is like saying hurricanes are on the increase…. All things equal, and they are, it’s hard to miss an intense tornado. The fact that intense tornadoes have decreased is the real number. I thank them for that….. The Sun has gone quiet. Before the Sun became quiet, the Earth had been experiencing a gradual rise in Global temperatures. This rise was due to the “recent” [1650 until now], increase in output as per the Sunspot record, i.e., more Sunspots, more active Sun. Now we have a warm oceans [due to Solar heat storage], and cooler continents [due to lack of Solar energy input]. The result is warm, moist, ocean air masses colliding with polar cold, dry air masses. As we know, this can produce violent storms. So, I disagree with the statement -> “But he said it would be ‘“a terrible mistake”’ to relate the up-tick to climate change.” It is just that the climate change [warming] has been the result of increased Solar activity and higher ocean (storage) temperatures over hundreds of years. Note: Solar warming has been going for hundreds of years before the AGW concept was weaned. Absolutely shocked watching what has gone on in the US over the past couple of days. My thoughts and prayers go out to everyone affected by these storms. I noticed that Joe Bastardi had been warning for the past week of the potential for severe storms in the affected areas, and has gone into some detail about why the storms are happening. I really hope common sense prevails when reporting these tragic events, and that the story is not hijacked by those with an agenda to push. This most current outbreak of tornadoes just happens to be generated with the same type relationship to the timing of the 1974 out break, from three days after maximum South lunar declination [4-21-0211 + 3= 4-24-2011] till the moon crosses the equator headed North on 4-28-2011. These same conditions are responsible for most of the large tornado outbreaks, in the past history. The study of the lunar declinational atmospheric tides has been very profitable in the prediction of these episodes of tornado and related severe weather [hail and strong wind events] it is a shame that the Main stream meteorological services don’t use the process to better predict life threatening weather occurrences like these. Multiple posts in regard to how this happens can be found on my web site. It has nothing to do with the background levels of CO2. ..or with oddball lunar alignments. ’74 was clearly Nature’s previous “switchback”. Cooling from ’42 to ’74, then warming from ’74 to maybe 2005, now cooling again. For a few years around the inflection points, the gradients get unstable and indecisive, with violent results. …actually I think the statement is entirely factual. The large-scale climate changed from an El Nino to La Nina state twice during the past 4-years. The Arctic vortex has been spectacularly strong for the past several weeks, with a strongly positive Arctic Oscillation. The very cold air-mass over the higher latitudes was unable to modify, and effectively trapped a huge pool of cold, dry air. Now at the end of April, the subtropical and tropical moisture sources are considerably more than during March. Thus, the setup was perfect for a powerful extratropical cyclone development that would spawn many tornadoes, due to strong directional shear mainly due to upper-level energy. Well I’ll be darned. I guess the climate boffins aren’t quite as dumb as I thought and the can indeed learn from past mistakes. It was a mistake to say that hurricanes Katrina and Rita in 2005 were the result of global warming. They aren’t going to make that particular blunder again. Winds is winds. Got it? Write that down. The man must be a meteorologist first and a climatologist a far second, the heresy is appalling, AWG/CC/ICS causes everything.Sarcasm now vented. Better detection and more people living in the same areas? More houses in the same areas? Just askin’. REPLY: But the overall number of tornadoes , especially the F1-F2 smaller ones , are on the increase , many of which went unnoticed before. Does anyone know how much our detections capability has changed between 1950 to 2011? Are you kidding? It’s not common sense…it’s an agenda. If some among the AGW crowd were saying that global warming caused the Japanese earthquake…do you think they’ll even blush to use this as ‘proof’…but, ya know, when it snows in Wisconsin in April…it’s just weather and has nothing to do with ‘climate change’. Also notice how many F5s were reported during the 1960s and 70s when we were, ahh…cooling. Kinda blows away (see what I just did there?) the theory that warmer = more violent weather. Yes/No? Does this severe weather have anything to do with a record snow cover in the northern hemisphere, a negative Pacific Decadal Oscillation, a strong La Nina, and warm gulf water? If so, then it could be called climate. As you all know, the earth has been cooling since 2005. It’s just a thought. I may be wrong. Well of course. We’ve been talking about this fact since I first had this explained to me in my meteorology classes 25yrs ago at UW Madison. Another case of non-homogeneousness. There are so many polistra, Ryan Maue, JanHM, seem to me are right on the spot. The only thing I will add is an apparent shift of the dry line. That may or may not be the case. It normally, on the average anyway, sitting over the Oklahoma-Texas border extended both north and south. Texas Panhandle rather dry and mid-east Texas, Oklahoma, and Kansas getting the moisture and the collision is where tornadoes are common. This year mid-Texas, Oklahoma, Kansas have all been abnormally dry, as if that dry line has shifted eastward ~250 miles and it has done that very thing many times in the past. I see nothing unusual with this behavior at all. It does remind me of the 70’s. In 1969 is the year two tornadoes tracked directly across Oklahoma City itself in the nighttime, which is rather rare. Ryan, is it not the case of frigid upper air, as you mentioned above, that causes the nighttime tornadoes? Have always wondered, if I might lean a bit on your knowledge. Also, I wish they could stop calling ‘1 tornado’ ‘40 tornadoes’ just because 40 people call in saying they have seen the tornado. Brother!! People my age would never do that if we already knew it was present and down on the ground. It’s real important to real people to know accurately if there is really, actually two tornadoes down instead of one. That can cause loss of life. If they have said where it is, and where it’s headed, for God’s sake please don’t call it in! Yes it’s called the lining up of available atmospheric parameters all in a row and bowling a strike. Happens occasionally and these past couple of weeks, with the overall longwave and shorwave patterns conducive, have resulted in mayhem. Re: the devastating tornadoes hitting the southern U.S., Joe Bastardi did an excellent job on The O’Reilly Factor this evening of explaining the causes and taking “climate change” out of the equation – in spite of O’Reilly’s interruptions. This footage from near the University of Alabama, in my opinion a fascinating study of the human element…of a frightened college student in an amygdala-driven fight or flight mode…. ….when facing a monster that is completely out of his frame of reference….a massive mile wide vortex with 260 MPH winds. Note how his breathing slows down as it moves away. As to the tornado itself, notice the highly organized classic wedge with the extremely destructive suction vortices spinning with accelerated violence around the main cyclone. This is stunning footage…and a study from so many angles. My condolences to all of those who lost friends or family. Here, let me help the warmers. The tornadoes are caused by AGW driven warmer warm fronts colliding with not colder but “relatively” colder fronts because the warm fronts are warmer, so the cold fronts are colder. The part that makes me spit really delicious Gnarley Head Zinfandel on my puter screen is when the warmers say, “exactly right”. And damn it, I hate spilling even one drop of Gnarly Head. Cheap wine (hey I’m on a budget so I can continue to drive me Jeep Cherokee through the mountains). Top notch taste. For those who are not aware of tornado research, one of the most highly respected researchers is Harold Brooks. Here is an interesting paper in which Brooks et al. discuss the increases in tornado reports and possible causes – not meteorologically related. 1. Weather is part of climate. 2. Tornadoes are part the weather. 3. The climate is always changing. 4. Therefore the weather is always changing. 4. Therefore, the severity, frequency, location, quantity of tornadoes is of course related to climate change. The only issue is whether or not and to what degree some the climate change that is always occurring in the background anyway is as a result of human activities. Until we can answer that question, we can’t say for certain to what degree the severity, location, frequency, etc. of any given weather pattern that might include tornadoes is the result of human caused climate change…so the correct answer to this question is: We don’t know. On the other hand….the thesis of this whole argument is a red herring. It makes perfect common sense that the ephemeral nature of tornados make them hard to report….and that, with the increase of technology and population…they “seem” more frequent. The red herring is, though, if the EF5 monster that just tore through a major college town in Alabama….were to hit a small town in the midwest in 1930….the story would still be the same: complete devastation. Also…in the Nanny State in which we live, thanks to the ultra-egalitarian “No Severe Weather Event Left Behind” program of the NWS…with the modern computer-generated tornado “warnings” citing only “doppler-indicated tornado” or “storm capable of producing a tornado”….well they actually help Cry Wolf on this issue to the general public. Then when a “real” tornado warning comes along….it might be too late for people have been desensitized to the false alarms of the past. No two tornado warnings are created equal, that’s for sure….especially in a densely populated area. Although a hurricane can certainly wreak widespread and deadly havoc…there is no atmospheric force on earth as instantaneously destructive…as an EF5 tornado. An entire township….flattened in seconds. Watch in the video….you see a real slice of America: whites, blacks, Asians, Mexicans….all stunned from the same loss. Until we can answer that question, we can’t say for certain to what degree the severity, location, frequency, etc. of any given weather pattern that might include tornadoes is the result of human caused climate change…so the correct answer to this question is: We don’t know. You will never EVER be able to “answer that question”. And the fact that you would use this tragedy to [again] try and hijack a thread due to your preexisting political “views”…in light of the tragedy that has occurred….is reprehensible. Maybe you should spend a little time concentrating on the science and physics and scale of what has just occurred….and just talk about it in and of itself…rather than put your own political vorticity on it. Have you no respect? Can you not carry on a normal scientific conversation that is free and clear of political spin? Do you not perceive the sheer magnitude of what has just happened? I keep looking for a normal R Gates who is a real person who would just take in and analyze about what has happened. And I get instead someone with a naive and preconceived opinion mouthing off as usual…as if the 300 lives were less important than that. Learn your place in Nature, R Gates. Right….in comparison…..we really don’t know jack. Nature continues to awe…and will do so many eons into the future. I think you’re taking the wrong look at this. Have been watching the newscasts here in Aus about these storms, really quite remarkable and sad at the same time at the loss of life and damage to communities etc. However, I am sure that if “Climategate” had not happened these events would be blamed on AGW in the MSM. You can see newsreaders just gagging for the opportunity to use terms like AGW or climate change in their articles, but they don’t. Just “Mother Nature” or “extreme weather”. It is only over the last three years or so I have started to learn anything about weather and climate and that has been conducted entirely through my internet connection. On a warming world the temperature/energy differential between the equator and the poles reduces (poles warm more than equator) and thus wind circulation patterns decline. On a cooling world poles lose more heat (relative) than the equator thus global wind circulation increases (bigger energy differential). More extreme weather events are to be expected on a cooling world. Not so? Exactly right. And not only Katrina and Rita but these Tornados too. It’s interesting that both 1974 and this year had many tornados in the US, and both years had flooding in Australia. Both 1973-1974 and 2010-2011 were moderate to strong La Ninas. La Nina generally causes storms to hit the Pacific Northwest and travel along the northern tier of the country before diving to the south. This spring, La Nina has kept the storm track very active in the north, causing storms to eventually make their way southward and cause the severe weather we have been seeing lately. La Nina may be the driving force behind both this year’s and 1974’s severe weather outbreaks. 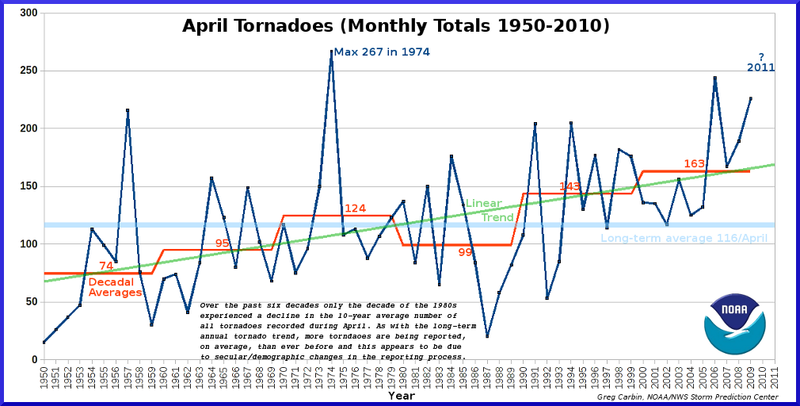 Over at “Weatherbell” Joe Bastardi has often pointed out a spike in the number of tornadoes that occurred the last time the PDO shifted to its cool state, and a La Nina was occurring. The population is much denser in the south now, but this is not a situation we haven’t seen before. What we haven’t seen before is the amazing video, because the last time this occurred such cameras hadn’t been invented. I blogged this to a previous post. I have to say that the media are being more carefull about blaming global warming for the outbreak. However, you always get some speculation. I’m still waiting for Al Gore. Reminds me of crime statistics. Crimes on the up, horrible, something has to be done and probably the o u t s i d e r s did it. In the alarmist world violent crime is down though so says the statistics so somebody has to be lying, eek it might be doctored, this needs more, way more, study money to study: up close and personal. At the same time, in the real world, it turned out that people just had been reported their stolen expensive bicycles en mass way more, but alarmist didn’t wont to hear that, because, not even the cops cares about bicycles. Never fear, Tommy, it will be – just as always happens. One gets the same answer to just about every climate-related question that could conceivably be posed. What we do know (but you might not care to accept) is that a stinking brew of hubris, activist dogma, incompetence and general dishonesty is unlikely to make things more certain. And that spending Trillions on “solutions” (that self-evidently don’t work), to “problems” that “we don’t know” are real, doesn’t seem such a good idea. Bob Tisdale pointed out the drop in U.S. coastal SST during the past several months. The Pacific cooling in that region has contributing to the cold air mass colliding with the warm moist air from the Gulf. No?